If cancelled or modified up to 15 days before date of arrival, no fee will be charged. The accommodation payment is to be paid in advance. The payment will be charged from the given credit card after the reservation. If you prefer another payment method, please contact our staff. Your room will be ready for you after 3pm if not agreed upon otherwise. You can visit our office which is open from Monday to Friday between 10am and 5pm. If you are arriving outside these hours, fear not! We have a way to hand out the keys to you. We collaborate with near by Shell service station that hand out our keys for a small fee (5 euros). The service station is open 24/7. Please let us know your estimated time of arrival time, and we will contact you to help you choose the most convenient way to get the keys. Children under 3 years stay for free. We will provide a crib, potty and high chair with no extra charges upon request. Pets are welcomed too! Please let us know if you are traveling with four legged family members, and we can accommodate you to an apartment where pets are allowed. Since we keep our pet apartments in as good of condition as the rest of them, we ask for small pet fee per animal. You can read the terms and conditions in full here. These apartments are situated on various locations throughout central Vaasa, within walking distance of the railway and bus stations. All feature a private balcony and free WiFi. Choose a hotel quality apartment for your stay in Vaasa. We give you an opportunity to live just like you would at your own home. Kotimaailma Vaasa provides accommodation in 15 furnished apartments in the city center area. Each apartment is fully equipped and of high quality. Whether you are visitingVaasa for a short term or need an extended stay hotel in Vaasa, our executive quality serviced apartments and furnished apartment are perfect for you. Please contact us for more than 7 night stays, and we will help you to find the best option for you. Our office is located at Pitkäkatu 37, where our staff is happy to help you during your stay. Our office is open on weekdays from 10am to 5pm. Outside these hours you can contact us via email vaasa@kotimaailma.com. In urgent matters please send us a message to +358 50 37766 86 to get the fastest assistance. 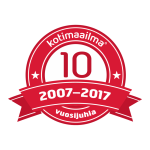 Welcome to stay at Kotimaailma Apartments Vaasa!